I know summer has just begun but it is not too early to be preparing for the fall! Did you know CASE has some amazing products to assist you as you prepare for the new school year? If you go to the CASE website and then to the Products tab or just click here for a short cut, you will find some terrific resources for you, your staff, and your general education administrators! One book that is fairly new to our website is Let'sTeam Up! by Kent Gerlach, Ed.D. This 144 page book is really a very practical set of three checklists and narratives for the principal, the teacher and the para-educator on how to "team up" effectively in order to ensure improved student achievement! Every school who uses para-educators needs several copies of this publication and at only $10, it is a real deal! And speaking of principals... I hope you have enjoyed the "what principals' need to know" series in our In CASE quarterly newsletter! The last installment was in the most recent newsletter that went out June 18! If you missed parts of the series, you can go back to the archived issues behind the Members section of the CASE website and log in with your CEC members' only log in. If you have been a member of CASE for very long, then you are familiar with the Lucky 21 series. Those books are also great resources for you as you plan for the fall! The articles in the newsletter by Dr. David Bateman on what principals' need to know will be our NEXT Lucky 21! We are anticipating it being completed in time for every CASE member to receive a copy in early September. Remember you must be a member at the time of the publication in order to get your free copy! Don't let your membership with CEC/CASE lapse during the summer! The Lucky 21 is a short and quick reference for principals but Dr. Bateman has written and recently revised a more expanded book just for principals. You can find this book, "A Principal's Guide to Special Education", on the CASE products page, also. Speaking of Dr. David Bateman... We have lined up our keynote speakers for the 26th Annual CASE conference, Continuing to Take Care of Business, in Atlanta, Georgia, Oct. 29-31 and Dr. Bateman along with Dr. Frances Stetson, and Dr. Martha Burns will be giving us all lots to take back to our jobs on how to continue to take care of the business of educating all students! On Wednesday of this week, July 1, the Early Bird registration for the Fall conference will go live! We only do the early bird for one (1) month so be sure to take advantage of this great savings! CASE has not raised our conference rates in over 4 years and if you have ever been to a CASE conference you know you are fed well. We recognize the effort and expense it takes to travel out of state to a national/international conference and we want you to totally get your money's worth — it will be a bargain for your system when you consider all you will be getting to bring back and use! Just another way to continue to take care of business! Time is running out... Have you registered for the CASE/CEC Summit yet? We need someone from every state at the Summit so we can "swarm" the Hill. And, don't forget all the amazing speakers we will have sharing with the group. Head over to the dedicated website and look at who will be working with us during the Summit. One of the highlights is the Thank You Reception CASE has been sponsoring for over 12 years. We always have a great speaker from OSERS or OSEP and this year is no exception! The Reception is all about partnerships and collaboration. It is not uncommon for us to have more than 15 different national organizations attend the reception. You don't want to miss seeing how other national associations respect and partner with CASE. Click here to go to Summit dedicated website where you can see the schedule, speakers, register and get your hotel all on one website! Last Week's Poll asked, "If you could thank one person whose actions truly changed you into the person you are today, who would it be?" Of those answering this week's poll, 38 percent said it was his/her parent(s). 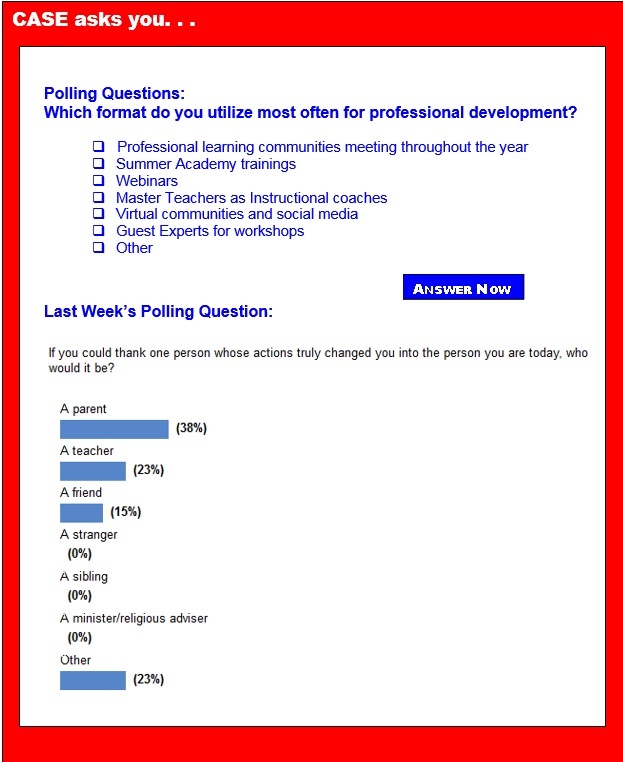 Second place was a tie between teacher and "other" at 23 percent. Fifteen percent indicated the person who they would thank for changing him/her into a different person was a friend. Hopefully, everyone took the time to thank that special person. If not, maybe now would be a good time to do that! Thank you to all of you who answered the poll this week. It is very helpful to our leaders to hear from our members! the U.S. Department of Education announced its award of more than $12.8 million in grants to help improve services and results for students with disabilities. The Special Education-Personnel Development to Improve Services and Results for Children with Disabilities/Preparation of Leadership Personnel Program will give $3.6 million in awards which will be used to help prepare graduate students for leadership positions in special education, early intervention and related services. US Department of Education approves ESEA flexibility renewal for 7 states, D.C.
Building on the significant progress seen in America's schools over the last six years, the U.S. Department of Education announced today that Georgia, Hawaii, Kansas, Missouri, Nevada, New York, West Virginia and the District of Columbia have each received multiple years of continued flexibility from provisions of the Elementary and Secondary Education Act, also known as No Child Left Behind. Brad McGaw knows that the move from high school to college will likely be a bit more challenging than for most seniors graduating this spring. In 2nd grade, Brad was diagnosed with three disabilities related to how he learns: Attention deficit hyperactivity disorder, auditory processing disorder, and language processing disorder. "I have to really think about what I'm going to be saying," says the 18-year-old who just graduated from Dallas Academy, a private school in Dallas. "I might say the wrong thing at the wrong time ... and I need to be more focused." McGaw learns best talking through material and linking it to things he knows. To accommodate his disabilities, teachers read tests aloud and provide additional prompts on open-ended questions. The House appropriations subcommittee responsible for setting spending levels for the U.S Department of Education and federal education programs met to prepare its fiscal 2016 funding bill for a full committee markup next week. Lawmakers unveiled the appropriations package. Among other things, it would slash funding for the Education Department and its programs by $2.8 billion by eliminating a slate of nearly 20 programs, including many high-profile Obama administration priorities. Minority students are significantly less likely than their white peers to be identified as disabled and may lack access to special education services, despite claims they are disproportionately tracked into and placed in such programs, according to new federally funded research. In a report published in the journal Educational Researcher, Paul Morgan of Pennsylvania State University and his colleagues show that racial-, ethnic- and language-minority students are underrepresented in special education. Yet federal efforts still exist to curb what some say is an excessive number of minority students who are identified as having a learning or intellectual disability, speech or language impairment, or as suffering from emotional issues. Regina Scanlon, a contributor for Education Week, writes: "I started teaching special education in 1970, prior to the Education for All Handicapped Children Act of 1975, or PL 94-142. I welcomed the enactment of that legislation, because it forced school districts and state education departments to provide a free and appropriate education for students with disabilities. Before its passage, children could be excluded from public school. PL 94-142 emphasized providing an education based on the individual child's needs." Life after high school was hard for Michael Jensen to imagine. His mother, who has been by his side for years, had no idea what was next for her younger son. Jensen, a 24-year-old Fresno man, has autism, a developmental disorder that affects his ability to communicate and interact with others. While many high school seniors graduate and move on to study at a college or a university, there aren’t many options for young adults with intellectual disabilities. Community-based programs exist to help disabled students find work or to provide them with daily social activities. But for some families, there is a desire for more — an opportunity for higher education and a path to independent living. Dyslexia is a prevalent learning disability characterized by difficulties in reading and spelling, despite average levels of intelligence. Those diagnosed also show weakness in phonological awareness, verbal working memory and processing speed. Younger students with dyslexia tend to struggle with sounds more than with the meaning of words. This can explain why students with dyslexia are often described as bright and articulate, yet their written work shows little evidence of this. There is a shift in the deficits driving reading difficulties from childhood to adulthood. While children with dyslexia find it hard to process the sounds of the word, adults with dyslexia struggled more with integrating the sounds with the meanings of the words. Low-income children exposed to unstable family environments or insensitive care-giving at age of 2 are at increased risk of cognitive delays by age 4, a new study shows. While the specific biological or environmental reasons for this are not known, differences in cortisol levels in children in the study at age 2 predicted their cortisol levels as well as cognitive delays at 4. Parents of children who are deaf face a critical responsibility to learn and use sign language, according to a majority of hearing experts quoted in the journal Pediatrics, although the question of whether or not to sign has grown increasingly controversial. Ten thousand infants are born yearly in the U.S. with sensorineural deafness, and data suggest that half receive cochlear implants, small devices that help provide a sense of sound to profoundly deaf individuals. Students show stronger concentration when working at standing desks, according to new research. A recent study in the International Journal of Health Promotion and Education found that students using standing desks improved their ability to stay on task in class by 12 percent — the equivalent of gaining seven minutes per hour of instruction time. Researchers from Texas A&M and the University of Louisville studied 282 students in grades 2 through 4 for an academic year. Twenty-four classrooms were randomly chosen to receive standing desks or keep traditional seated desks.